Offering direct access to the beach, this Jimbaran Bay resort is within 3 mi (5 km) of Jimbaran Beach, Samasta Lifestyle Village, and Udayana University. Kuta Beach and Legian Beach are also within 6 mi (10 km). 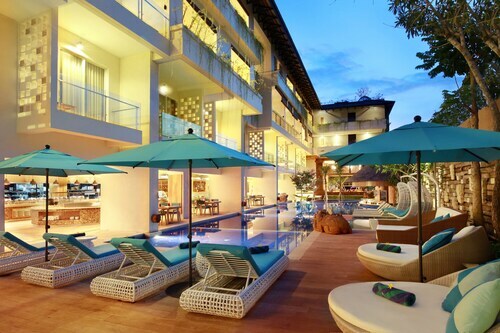 This family-friendly Kedonganan hotel is located near the beach, within 3 mi (5 km) of Jimbaran Beach and Lippo Mall. Circus Waterpark and Samasta Lifestyle Village are also within 3 mi (5 km). 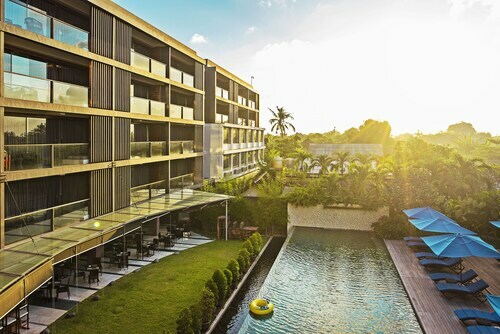 Located in Jimbaran Bay, this hotel is within 3 mi (5 km) of Jimbaran Beach, Samasta Lifestyle Village, and Circus Waterpark. Udayana University is 2.9 mi (4.7 km) away. 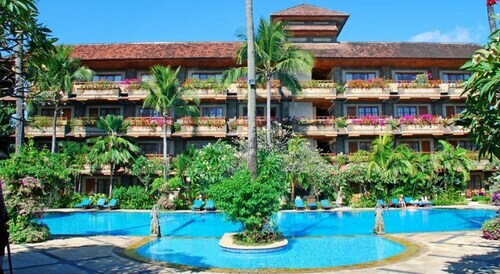 Located in Jimbaran Bay, this hotel is within 3 mi (5 km) of Jimbaran Beach, Samasta Lifestyle Village, and Circus Waterpark. Udayana University is 3 mi (4.8 km) away. Located in Jimbaran Bay, this spa resort is within 3 mi (5 km) of Jimbaran Beach, Samasta Lifestyle Village, and Udayana University. Circus Waterpark is 3.1 mi (5 km) away. Offering direct access to the beach, this Jimbaran Bay hotel is within a 15-minute walk of Benoa Square and Kedonganan Fishing Pier. Jimbaran Beach and Honorary Consulate of Italy are also within 1 mi (2 km). Positioned 45 kilometres south of the heart of Bali, Kedonganan is a popular neighbourhood to swing by when exploring the region. 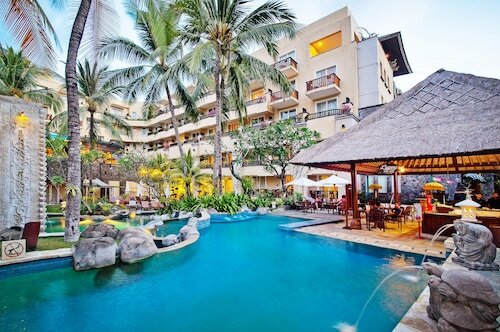 The famous experiences of Bali include the Tanah Lot and Kuta Beach. Generations of families and neighbours have convened and mingled at Benoa Square. Keep the tradition alive and stop over at the piazza. 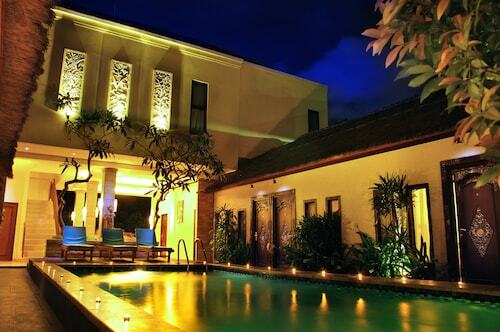 If you'd like to sleep close by, consider the Four Seasons Resort Bali at Jimbaran Bay and Temple Hill Residence Villa. Participate in a truly local experience with the children at Morning Market. 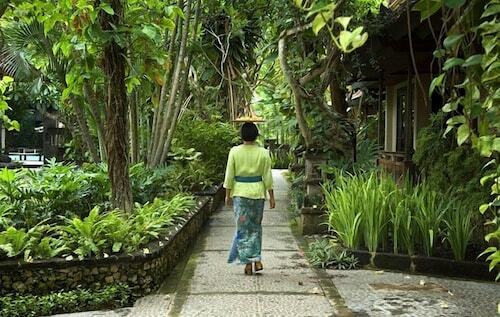 If this spot is more your thing, try the Karma Jimbaran and Ahimsa Beach. Are you dreaming about visiting Kedonganan? 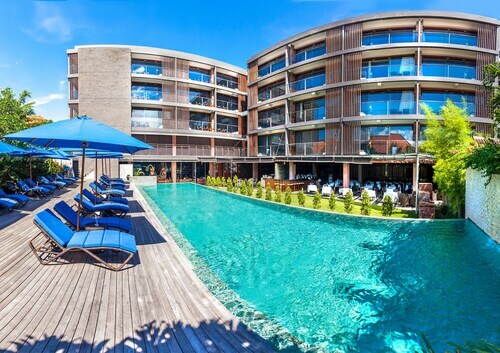 If you are able to pay a bit more, it's worth having a gander at the amenities at the Watermark Hotel & Spa Jimbaran Bali. Keen to check out the cafe scene in in Kedonganan? Whether you're hanging out with friends or just relaxing in a comfortable corner with a hot drink, you can't go past Baliku Cafe. All the sightseeing certainly takes its toll. Fortunately, Le Méridien Bali Jimbaran dishes up delectable meals that will be sure to satisfy even the most empty-stomached travellers. If you wouldn't mind a few drinks before calling it a night, why not stop by DEWATA CAFE? Who knows, the bartender might even be able to give you some tips on what you can do tommorow! 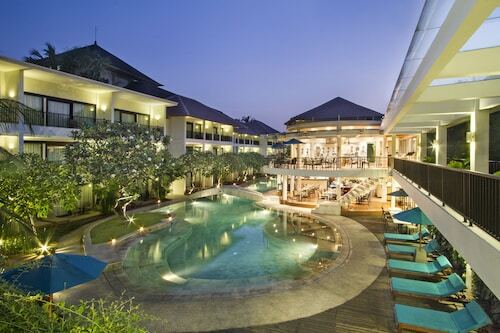 If you can't find the perfect Kedonganan hotel package, check out the Jimbaran Beach hotels guide. Alternatively, the Wotif Tuban hotels guide will get you staying nearby. From flights to accommodation, activities to car hire, Wotif is here to help make your Kedonganan dreams come true. How Much is a Hotel Room in Kedonganan? Hotels in Kedonganan start at AU$16 per night. Prices and availability subject to change. Additional terms may apply.